Salvation And Survival: Would You Like A Tall or Grande Cup of Satanic Symbols? Would You Like A Tall or Grande Cup of Satanic Symbols? I've long disliked our culture's fixation with "trendy" things, yet I applaud the entrepreneurship that created success from a simple idea. Take for example, Whole Foods. I am one of the few that I know who can remember the very first Whole Foods store on Lamar Avenue in Austin, TX. At the time, it was known as a "hippie" store that catered to a largely unwashed caste of people who loved sprouts and strange-smelling vitamin powders. It was also known for selling the best smoothies in town; a relatively new invention at the time. And it has been fun to watch this quaint, neighborhood store grow into the mainstream, mega-success that it is today. I give it enormous credit for giving "healthy" foods such a huge "cool factor." The same goes for Starbucks... to a point. How brilliant to take the simple idea of a cup of coffee and turn it into the addiction that it has become for millions. But I'm not as enamored with the "underbelly", so to speak, of this national pastime. For starters, I just want to enjoy your product, and not be subject to your consumer bias or political views. Stating what kind of customers you prefer not to serve to (those with religious convictions about certain social issues), while spouting a company mission statement that says "we embrace diversity to create a place where each of us can be ourselves. We always treat each other with respect and dignity. And we hold each other to that standard" -- well, it just doesn't ring true. Apparently that motto is only applied towards customers who agree with your agenda. 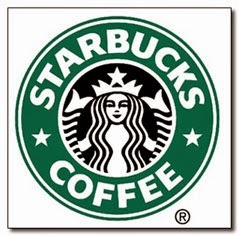 But this post is not really about Starbucks political or ethical motives. It's about their underlying culture. A woman was served a cup of coffee at a mall in Louisiana, and found something quite distasteful displayed with caramel and whipped cream .... Satanic symbols. First of all, let me just say that it's enough for me that the coffee chain has chosen a mythological woman who stands for obsession, addiction and death as their corporate logo. 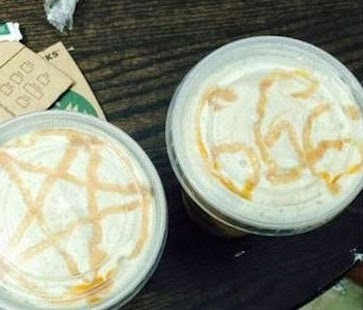 But the fact that a Starbucks employee felt it was okay to draw "666" and a pentagram in caramel, and then hand it to the customer, may speak to a deeper problem in this corporation's culture. I applaud the customer's genius in posting the photo and her experience on Starbuck's Facebook page, where it could not be ignored and swept under the rug. And she was absolutely correct in pointing out the obvious: "I am in no way judging his [the server's] beliefs or dis-meriting his beautiful artwork, I am however judging his lack of professionalism and respect for others. I am a teacher in the public school system and if I were to present a child of atheist or pagan believers with a Christian art project I could be sued in a heartbeat,” the woman concluded. “I am of Catholic faith and would love to share in my beliefs daily. Fortunately I have enough common sense to present myself with professionalism and follow an ethics code. Perhaps that could be suggested to this particular [Starbucks] location." Whether the employee thought he was being funny, or was expressing a sincere opinion with his presentation, I find it disturbing that occult images were not taken more seriously by Starbucks' management. Their simple apology doesn't carry the same weight as the evil-intentioned insult. Besides, there is such a thing as taking "diversity" too far; and if creating "a place where each of us can be ourselves" includes the acceptance of Satanists, then I choose to frequent a less popular coffee shop. I am actually tired and bored by the Starbucks atmosphere ... and here's the irony! ... countless people, like zombies, sit through long lines at the drive-through, or file in each day; seduced by the lure of overpriced coffee, and trying to look important (or at least fashionable) with their Apple laptops; crowded around those tiny, little tables. Although they are buying into Starbucks' celebration of diversity, they all look exactly alike! I can't help but think that this is another example of how our culture has lost its way. We just follow in lock-step with the rest of society. We become addicted to our conveniences and our pleasures and we never question the character, integrity or reputation of who we associate with. We will even accept an overt display of Satanic symbols, if there is a way we can somehow justify our obsession with that cup of java. Hey, maybe Satan oughta consider incorporating the Mark of the Beast with some new fad or trend that everyone's addicted to! Wait .... I have a feeling he's already thought of that. Our culture will be led like sheep to the slaughter. Beware! Colossians 2:8 "See to it that no one takes you captive by philosophy and empty deceit, according to human tradition, according to the elemental spirits of the world, and not according to Christ."